HUSSON -Plan de la ville de Gibraltar. HUSSON, P. - Plan de la ville de Gibraltar. Plan de la ville de Gibraltar. - HUSSON, P.
Title : Plan de la ville de Gibraltar..
Map maker : HUSSON, P.. Date : La Haye, 1710. Size : 12.8 x 16.6 inches. / 32.5 x 42.2 cm. 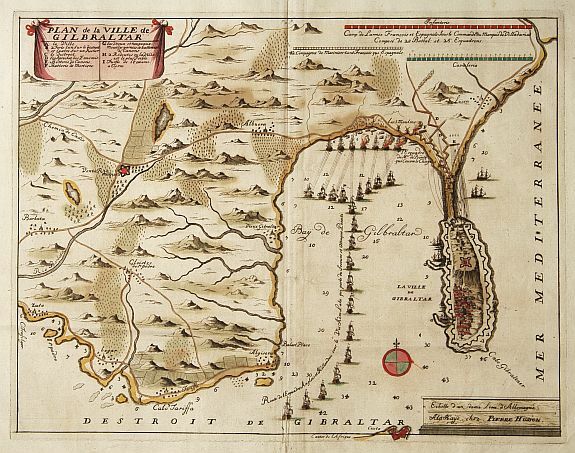 Description :A rare and fine bird's-eye plan of Gibraltar and Spain mainland, showing the positions of both armies during a siege by the Dutch, English and French armies. Condition : Repair of split lower part center fold, 2cm. into engraved area.